Former Senate President, David Mark, has come under mounting pressure to pull out of the February 13 Benue South senatorial rerun.Ten groups, under the aegis of the United Idoma Citizens, on Sunday, called for Mark, who has been a senator since the return of democratic rule in 1999, to step down. This comes barely one month after 10 other groups, under the aegis of the Conference of Idoma Pressure Groups, asked the senator to step down. The UIC, in a statement by its coordinator, Sunday Ogbe, said it was time for Mark to step aside, having served as the political leader of the Idoma for sixteen years. The group listed several abandoned projects by Mark, including the construction of Oweto Road, a dam in Otukpo and the University of Medical Sciences. “Should this be a credit or a discredit since these projects are either nonexistent or levels of completion are still below 30 per cent? “Why has Mark chosen to return to the Senate as a floor member, having served as the number three man in the nation for eight years. “Mark’s 16 years in the Senate is a complete disaster. His achievements were only seen on the pages of newspapers and blogs. “As the number three man in the nation for eight years, his kinsmen back home had no portable water,” the UIC said. According to the group, the roads in Mark’s constituency are in deplorable condition and those the federal government paid for were not executed by his recommended contractors. 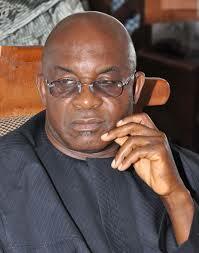 It added, “It is sad, yet shameful, that Mark is asking for votes from Idoma people he betrayed. “He has been using the creation of Apa State as a gimmick to hoodwink our people. The group described the former Senate President’s style of politics as divisive of Idoma West versus Idoma North. It further accused Mark of supporting some purported Idoma elders, who asked the Federal Government to sack the Chief of Defence Intelligence, Air Vice Marshal Riku Morgan. “We thank the Senator for his 16 years of ‘disservice’ to Idomaland and request that he kindly give way to the young and progressive Daniel Onjeh of the All Progressives Congress,” the UIC added.